Traditionally, ships were named or “christened” when the ship reached the stage in its construction where it could enter the water. Speeches would be made and then a bottle of champagne would be broken over the bow starting the ship sliding down the construction rails into the water. Modern ships, however, do not “slide down the rails.” Instead, they are built in dry docks and when the ship reached the point where it can float, the dry dock is flooded. While there often is some type of “floating out” ceremony, tt does not have the drama and excitement of the old process. As a result, ships are officially named much later in their lives. Many have a naming ceremony when they enter service. Still, others have their naming ceremony when they reach a port that will be their primary base. For Carnival Horizon, the naming ceremony was held on May 23, 2018, when the ship came to New York City for the first time. The ship had entered service on April 2, 2018. After a short series of cruises in Europe, Horizon did a transatlantic crossing with passengers. 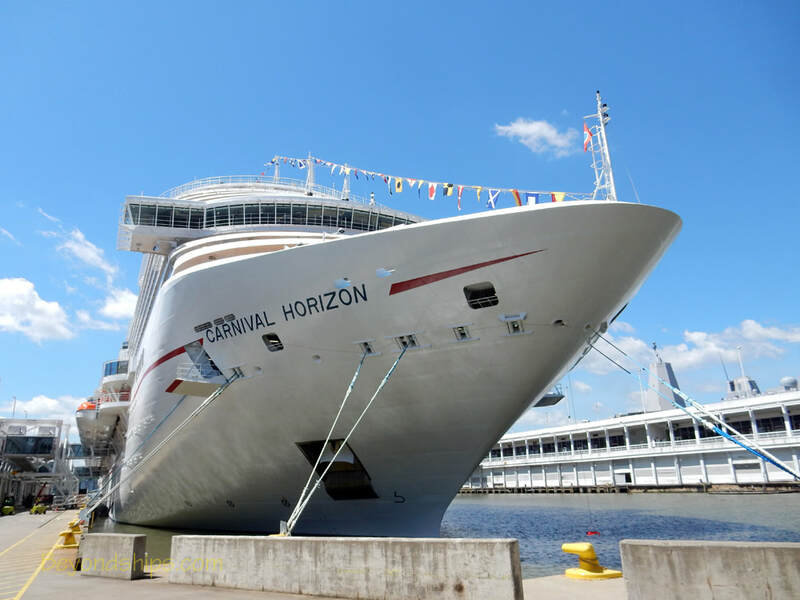 Having the naming ceremony in New York was appropriate because the ship is aimed at the American market, New York was Horizon's first American port and will be Horizon's base of operations for the summer 2018 cruising season. 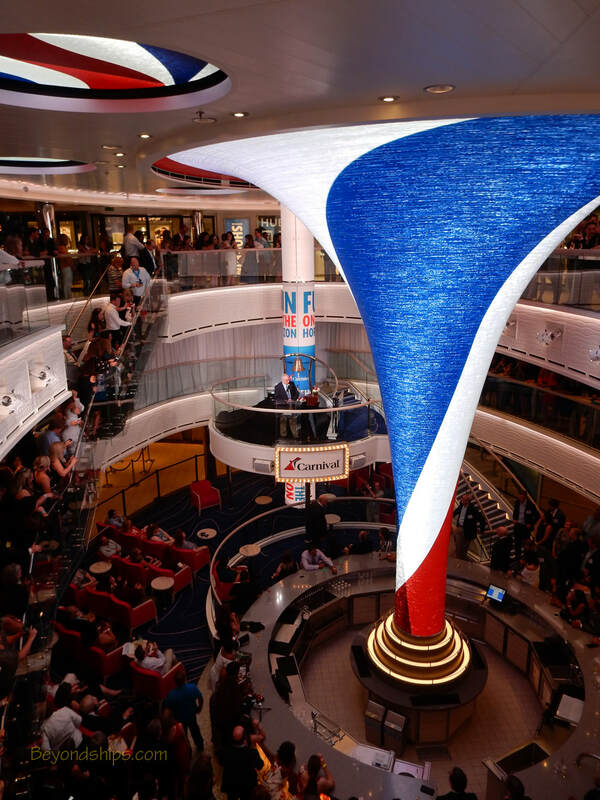 The scene for the official naming of Carnival was Horizon was her's multi-deck high atrium. Brand Ambassador John Heald acted as mater of ceremonies and introduced Carnival Cruise Line President Christine Duffy. “Carnival Horizon is ship number 26 in our fleet. She is the sister to Carnival Vista that we have been waiting for. We planned this event to give you a taste of all that she has to offer including many new features that we are introducing for the first time. This ship has the first-ever Dr. Suess themed waterworks; our first-ever Bonsai Teppanyaki restaurant; and we are very excited about our Guy's Pig and Anchor Smokehouse/Brewhouse, serving up real deal barbecue favorites created by our very good friend and partner Guy Fieri. And one of my personal favorites, we have two decks of mall-style shopping with the first Victoria's secret at sea. Horizon is the second ship in the Vista class. Of course, many of the things that have been favorites on Carnival Vista, you will find on Horizon from our Skyride at the very top of the ship, to our Imax movie theater, our Havana Club and Lounge and, of course, all the great kids clubs and arcades that have to do with families. Carnival sails more children than any other cruise line - - 5 million guests with 800,000 children. Sail with us each year. ​Above: Horizon's atrium during the Naming ceremony. 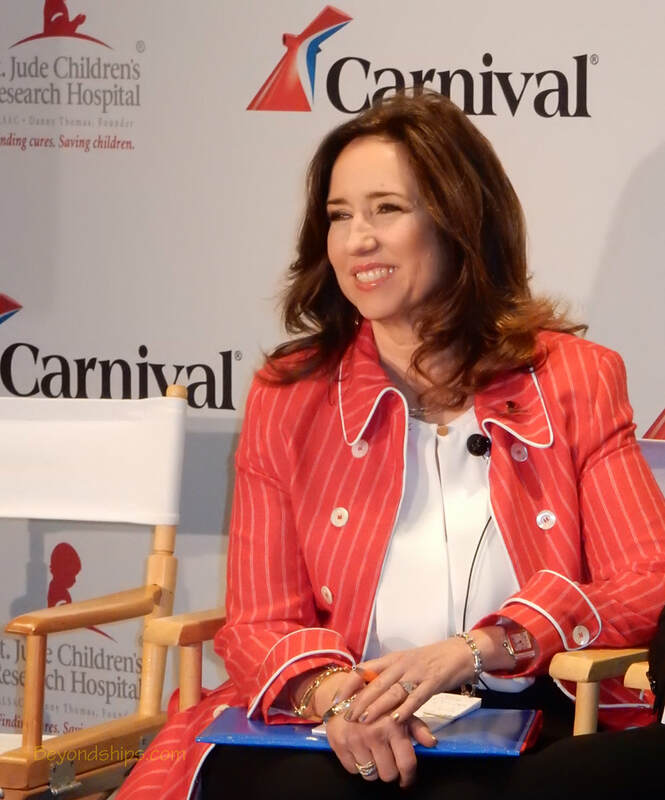 Below: Christine Duffy, President of Carnival Cruise Line. 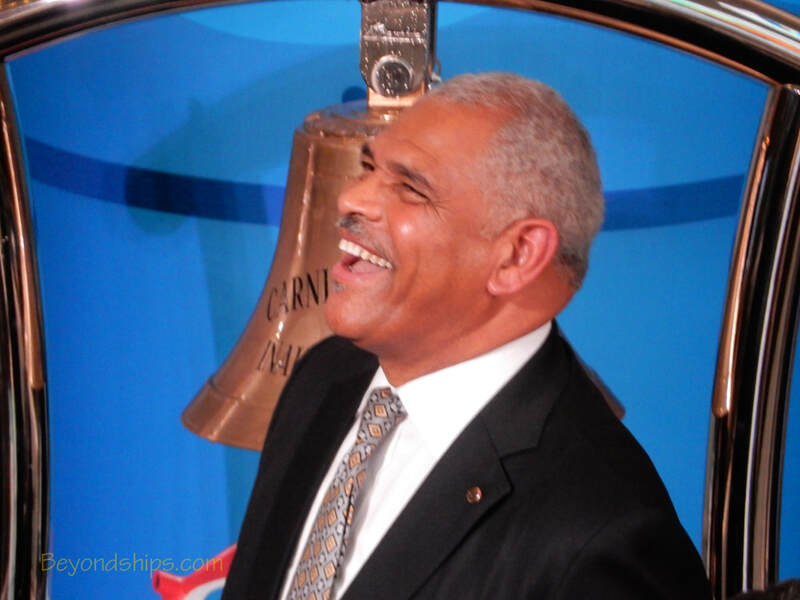 Left: Arnold Donald, President and CEO of Carnival Corporation, the parent company of Carnival Cruise Line. 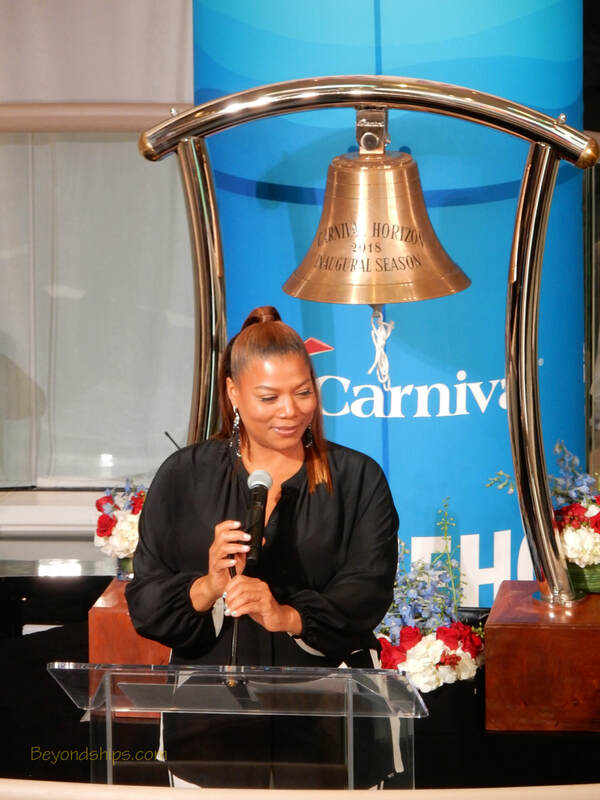 Ms. Duffy returned to the podium to introduce Queen Latifah, who had been designated as Carnival Horizon's godmother. An ancient tradition, the godmother names the ship and offers a wish for good fortune. “We look to our godmothers to personify the Carnival values and support the vision of our founder Ted Arison who believed that every American should have the right to an affordable and fun cruise vacation. We are so happy to have a godmother who not only personifies the Carnival values but is a long time supporter of St. Jude's." While this ended the naming ceremony, the celebration continued far into the night. Celebrities, VIPs and cruise line executives mixed and partied with press and travel agents. There was an atmosphere of celebration in which the officers and crew join as they host the visitors. It was an opportunity for them to show off the result of months of work that began when the ship was still in the shipyard. Thie pride the crew took in the ship was particularly apparent on Horizon. 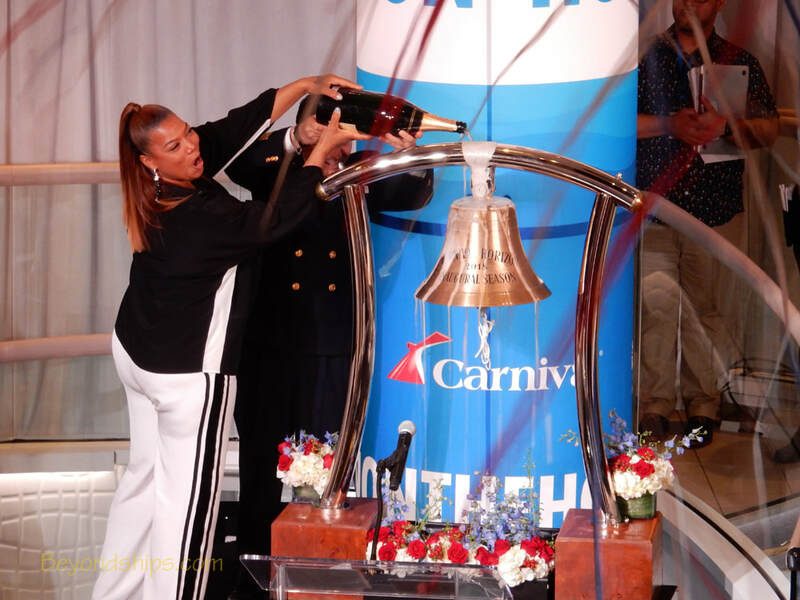 Above: Queen Latifah, godmother of Carnival Horizon.